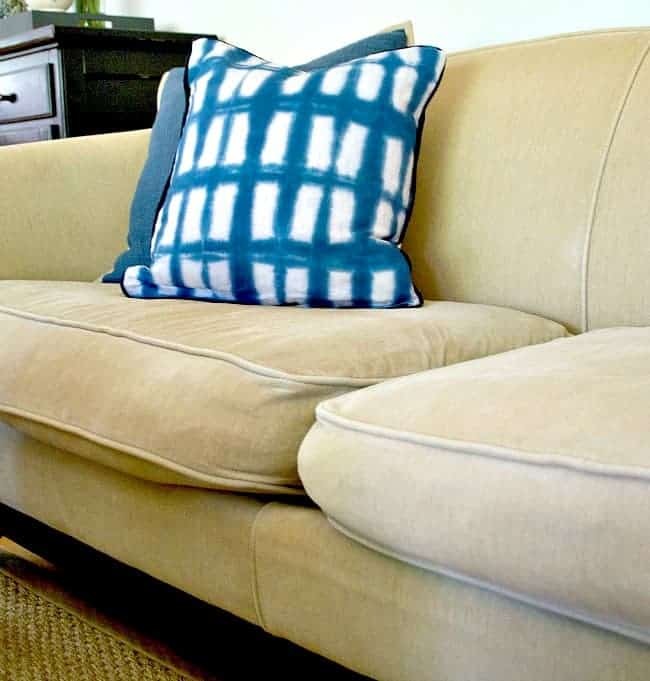 A quick and easy fix for sagging couch cushions. When the hubs and I got married and bought our first house, we were excited when the time came to buy new furniture. We needed new everything to furnish our home and that included a sofa. Neither one of us had ever purchased furniture before, and we were young and broke, so we went for cheap and as close to good looking as we could get for the money. We eventually learned that when you buy a cheap couch it doesn’t last long. When it came time to buy our next sofa, we did a little research first and spent a little more. Long story short, we gradually worked our way up to a well-made sofa that would last many years. 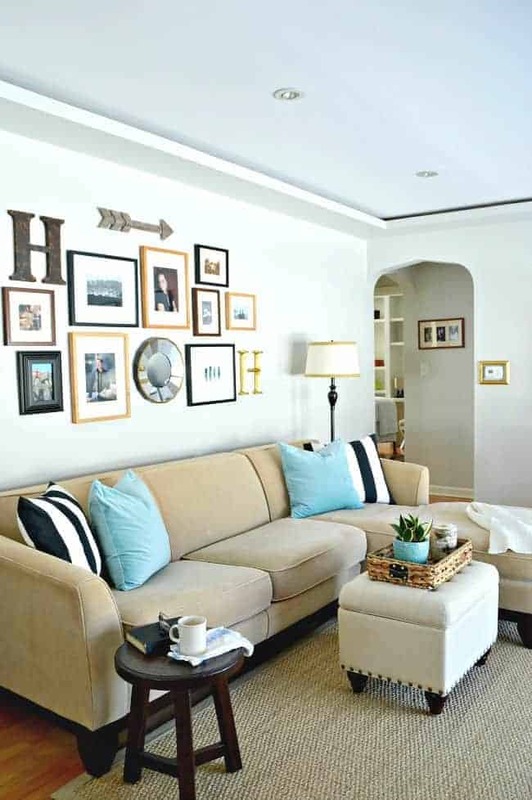 Fast-forward to the present day and our Pottery Barn sofa (similar one, here). We’ve had it for 13 years now and it’s moved with us, from Florida to Illinois and now to North Carolina, and has held up very well. Recently though, I’d noticed that my back was hurting when I sat on it. It’s gotten a lot of use from our family and the result was sagging couch cushions, 13 years of butts plopping down on it will do that. Once I figured out it was the cushions I knew it was time to get them replaced. Of course, being the cheapskate DIYer that I am, I wanted to try to figure out a way to do it myself. I’m so glad I did because it turned out to be a really easy fix. This project was actually done a few months ago when we lived in Illinois but, because of the move, I wasn’t able to put the post together until recently. Little did I know when I did this that we would move into a house with a living room that was too small to accommodate my beloved couch. Unfortunately, or fortunately, my loss will be someone else’s gain. Anyway…the old foam was wrapped in a down cover but I decided to go with batting wrapped foam. Upholstery foam is expensive but new down replacement inserts were outrageously expensive. I was tired of pulling feathers from the old ones, so I skipped the down-wrapped and just went with a high quality batting wrapped foam. Shopping for the foam took some time. 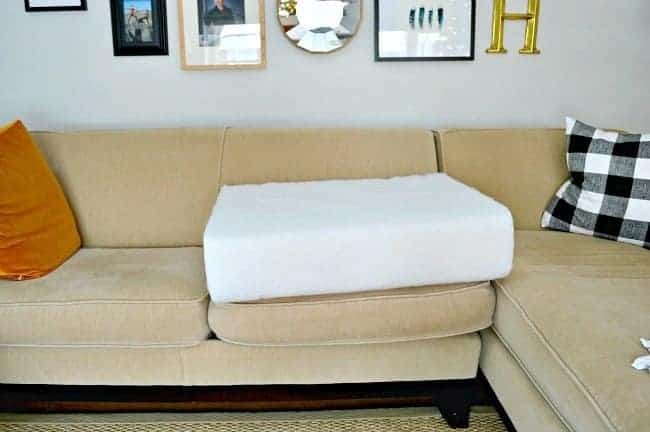 I researched and looked at a lot of websites and once I settled on a shop that I liked, I made exact measurements from the sofa cushion covers and had the foam cut to size and wrapped in batting. They were delivered to me all ready to go. Like I said, it was expensive, at $173 for two cushions, but I got a really good quality foam that should last years. So, how did I get that big, cushy piece of foam in the cover, you ask? Painter’s plastic and a vacuum. Yup, that’s it. 20 seconds and the foam was in the cover. I figured that a video would show the process better than photos so, with the help of my trusty assistant, we made one. Check it out at the end of the post. If you’d rather have a blow by blow, here is how we did it. Take the painter’s plastic and spread it out. Place the foam on on half of the plastic and pull the other half over to cover the cushion completely. 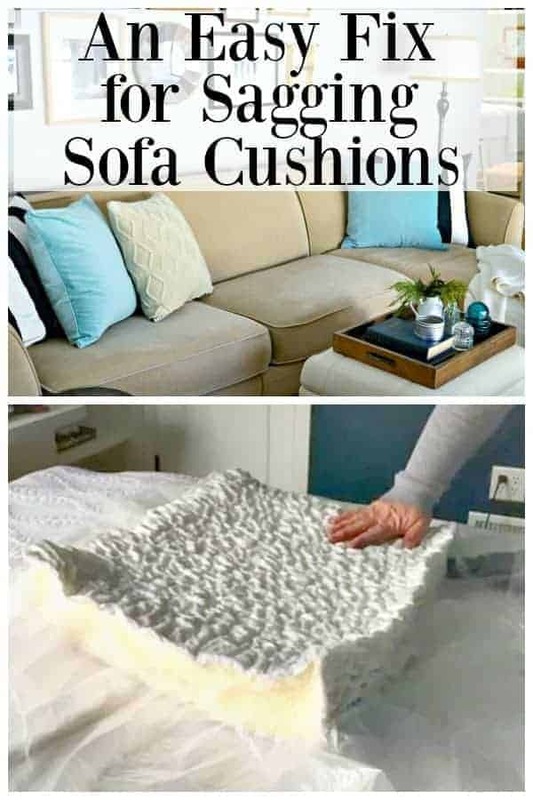 With your hand, push all of the air out and tuck the plastic around the cushion. Next, take your vacuum and put the nozzle under the plastic against the cushion. The cushion will quickly compress. Remove the vacuum nozzle and quickly place your compressed cushion in the sofa cover. As the cushion inflates, work at getting it in the cover so there are no lumps or bumps. Pull the plastic out, it will rip and tear but it will all come out, and zip it up. 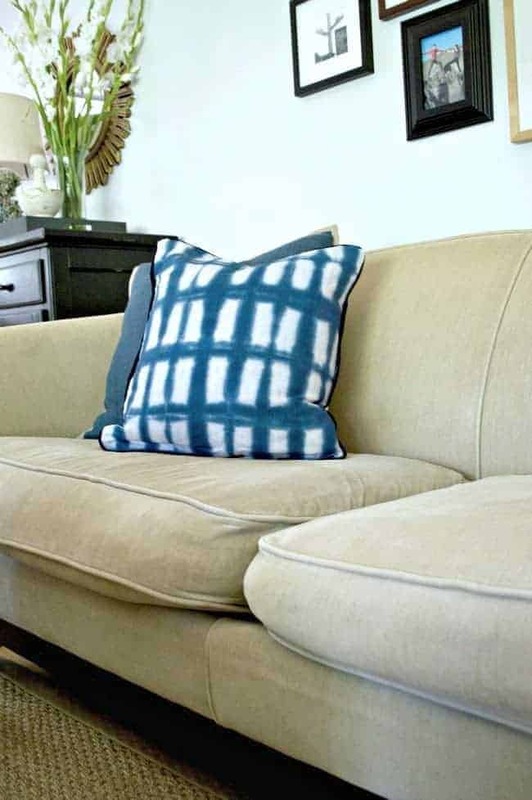 Voilà…a new couch cushion that looks like it was professionally done. Can you believe how quick that was? And super easy, too. The cushions look like new again and will last for years. I’ve also shared a post with tips on how to buy a couch. What to look for and some mistakes I’ve made from past purchases. I’m getting ready to try to refresh the cushions of our two PB Basic slipcovered couches and I was delighted to find your post!! It actually gives me much-needed courage to jump in. However, what happened to the “Video” of you stuffing the foam back into the covers? Would love to view that. Tks! What density foam did you order? Hi Sandy! I’m not sure if this is helpful but I bought a high density foam. It’s 6 inches thick, the firmness is 33 lbs., and the density is 24. Hi Diana! Ordering the foam was nerve-wracking for sure. It was on the pricey side and I knew that if I got it wrong, it would be a waste of money. With that said, I ordered new inserts that were the exact size of the old ones. Hope that helps. I am SO glad I found this post! I have the exact couch you do (PB Greenwich upholstered, right?) with the exact same issues and the cushion insert fabric has practically disintegrated on the chaise, leaving me with a bag of feathers. PB Customer Service has been less than helpful thus far, sending me links for furniture restoration companies, build your own chaises from their other lines (not the same size) but the DIY Upholstery Supply looks amazing. Thank you! Excellent I have a chair I paid a small fortune for and my hubby falls asleep in it and it needs help. That’s great, Valerie. So glad you found this little tip useful. you just saved me over $700, I’m doing this as soon as I find the material!!! That’s great, Priscilla! So glad I could help! The plastic and vacuum is absolute genius! Thanks for such a great tip. No problem with piggy backing a comment, Norma. I appreciate your visit and comment. I think that you could definitely do this on your own. It was really easy to do and only took a few minutes. Let me know how it works out for you. FABULOUS idea of using the vaccuum! Pinned and will be featuring tonight on Inspire me Monday! How exciting! Thanks so much, Kim. That is a great idea. We just got new cushions for our sofa. I am saving this for when I have to get new ones again. Instead of wasting money I can do this. Thank you. I wish I knew this when I had my camper. New cushion were very expensive. How did you seal the painters plastic around the cushion? No seal around the cushion. We just made sure the air was out and pushed the plastic against the cushion. The vacuum formed, well…a vacuum in the plastic and compressed the cushion. Amazing and it worked like a charm. Thanks for the video! How did you get the plastic to seal around the edges so you could use the vacuum? I’m intrigued! It worked brilliantly though! Hi Liz. We didn’t do anything to seal it, just pressed the air out and made sure that the plastic was snug against the cushion. The video is pretty accurate on exactly what we did. It’s amazing to see it work like that, and that it was so simple. Hope this answered your question. I never would have thought of compressing with a vacuum! I have a large chair that has down cushions and it also sags. I will try your method. Thanks! I’m so glad that you’re going to give it a try. Good luck! Where did you find the foam inserts? I have no idea what to look for when purchasing cushions. 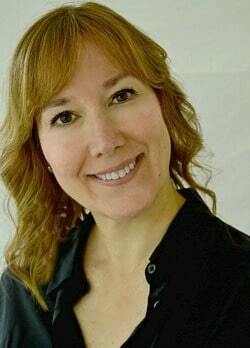 Hi Lou Ann. I had no idea when I started looking. I just kept researching and looking at different kinds of foam. I knew that I wanted something that would last so that’s what I concentrated on. At first I looked into down cushions/inserts, but once I saw the prices, I changed course. I would suggest you just read up on the different types of upholstery foam and zero in on the firmness that you want and a price range. I ended up buying mine at DIY Upholstery Supply. Hope this helps. I tried this with my old Bassett sofa. The cushions were just awful, and when I chose new foam cushions I overcompensated for the sagginess and they ended up as hard as a rock. I’m sorry you have to get rid of your sofa, it’s beautiful! Thanks, Anne. I’m sad to see it go but it’s just too big. So sorry that yours didn’t turn out the way you had hoped. I was nervous about that very thing but I think it’s good. They are definitely firm compared to what they were, but I think it’s comfortable. Did you sell the couch yet? Thank you so much for this post! I have a 5 year old sofa that I paid a lot for and it is stuffed with down. However, it is always loosing feathers and the cushions always look so messy. I love the sofa and do not want to get a new one, so I’m going to try this. Thanks so much for the great tutorial! I hope that you have a blessed day and a wonderful week!!! Genius! Love the video too! Question? Where did you buy the foam? Did you have to cut it on your own? Thanks Vel. I shopped around and ended up ordering my foam from DIY Upholstery Supply. I made exact measurements from the sofa cushion covers and had it cut to size and wrapped in batting. Hope that helps.